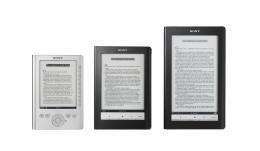 Maybe now it's an actual competition between Amazon's Kindle and Sony's forlorn "Reader" e-book. Sony recently announced a new larger-screen model going on sale by Christmas for around $399. The Reader Daily Edition (aiming to deliver newspapers, perhaps?) has a seven-inch-wide touchscreen and includes 3G wireless service from AT&T. But it's Sony's new software and services that are going to change the dynamic. Sony also said it's partnering with OverDrive, a company that distributes electronic books to libraries, so Reader users will be able to "check out" free digital library books that expire at the end of the lending period. That's a much bigger deal than the earlier announcement that Sony's working with Google to bring public domain material to the Reader. If you're a heavy book buyer looking for a digital reader, Amazon's big selection may still pull you in. But the Kindle will be marginalized if e-books from Sony and others get enough books from a wide variety of sources, especially free and current titles from libraries. The question is, would Amazon ever make it easy to borrow instead of buy books on the Kindle? Why does this sound promising, then read like an advert?